Free license key giveaway in collaboration Balesio with CHIP magazine. Available unlimited unlimited number of FILEminimizer Suite license key on the offer. 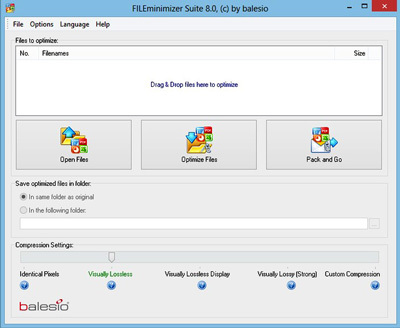 On this free offer, download Balesio FILEminimizer Suite with free activation code. Save €78 on this promo. The serial license key given is single user. FILEminimizer Suite is a tool to compress image and office file. It can reduce the file size up to 90%. The software supports Word, Excel, PDF, PowerPoint, and any type of image files. The suite version also can be integrated with email client programs such as outlook and lotus notes. On the offer today, Balesio FILEminimizer Suite is free. Download the software with free license key from the to compress your files. Balesio FILEminimizer version on this giveaway is the latest version. To obtain one free copy, visit the following link. Giveaway Balesio FILEminimizer Suite: Visit the link! To get the license key, please follow the steps below. The vendor gave unique activation code to everyone. It easy, just visit the giveaway page above. Fill up the field requires on the online form. Then submit the form by clicking on “Request License”. You’ll receive one free license key plus download link the giveaway version of Balesio FILEminimizer Suite. Download, install and activate the software using the code received in your email. The license key on this offer is works on the newest version Balesio FILEminimizer Suite. Unfortunately the giveaway free license is available for a short time only. Download the software before the giveaway expires. PromonDeals.com (PD) offer valid info about freebies & coupon code.